Center Medallion Grey/ Ivory Loop Pile Indoor-Outdoor Area Rug - 6'7" x 9'6"
Center Medallion Grey/ Ivory Loop Pile Indoor-Outdoor Area Rug - 7'10" x 10'10"
This elegant indoor or outdoor area rug is constructed of 100% polypropylene looped yarn made in Egypt. It features a classic neutral palette using high contrast colors and a casually sophisticated pattern that feels fresh but timeless. Dimensions 94.49 In. X 94.49 In. X 0.12 In. 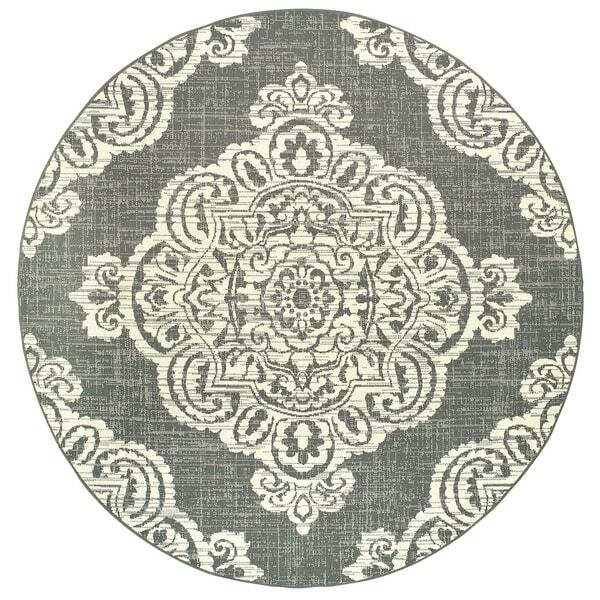 Center Medallion Grey/ Ivory Loop Pile Indoor-Outdoor Area Rug - 1'9" x 3'9"